With the reissue of The Rolling Stones' classic Exile On Main St due out next week, guitarist Keith Richards is in a nostalgic mood, although he does admit that listening back to some of the tracks he recorded nearly four decades ago did test the powers of his memory. "The tracks we found in the vault are mostly as we left them 39 years ago," Richards told The Independent. "I can hear stuff and go, 'Oh, my God, did I actually play that?' Sometimes you just take off. The spirit, the feel of it, it's well worth putting it out, because it's the flavor of the era." For a few of the bonus recordings, which Richards and Jagger "sweetened" with current Stones producer Don Was, Keef says, "I stroked an acoustic guitar here and there. Mick did new vocals for Plundered My Soul and Following The River. "We had to draw the line somewhere. We decided that, if we were going to repackage and put Exile out as a box set, then we should add some of the other stuff that we had left over. When you make records, these things sort of fold over. There's stuff from Sticky Fingers that went into Exile at one end and out of the other into Goats Head Soup. Nobody writes an album from track one to track 12 and says, 'That's it.' It's a continual process and hopefully it will continue." One aspect of the process that many fans are hoping will continue is hearing the old songs in the form of full-album concerts. Richards hinted to Xfm that the Stones could very well revisit such discs as Let It Bleed and Exile by playing them from start to finish. "I have heard the idea being mentioned in passing," he said. "It's in the rumour area...[but] where there's smoke, there's fire, you know?" The Stones first considered the concept "a few years back," Richards said, "where tonight you do Let It Bleed." But he stressed that the band still "haven't taken it by the horns yet." 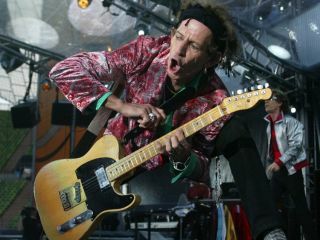 Talk of a Stones tour for 2010 has been heating up, but as of yet no dates have been announced.